31 By chance a priest came along. But when he saw the man lying there, he crossed to the other side of the road and passed him by. 32 A Temple assistant walked over and looked at him lying there, but he also passed by on the other side. 36 Now which of these three would you say was a neighbor to the man who was attacked by bandits?” Jesus asked. We began reflecting on this passage yesterday by focusing on the interaction between the lawyer and Jesus and the Good Samaritan parable (you can read that here). Today, let’s reflect on the short passages before and after that middle section. The first short passage (vv.21-24) are really the conclusion to the section about the disciples (9.51-10.24). Jesus is overcome with the joy of the Holy Spirit and bursts out into prayer. Luke uses the same language in v.21 as he did in 1.47 to describe Mary being filled with the Spirit as she burst into song. Luke also gives us the rare treat of listening in when Jesus prays to the Father. Then he blesses the disciples, telling them they are very blessed to see his ministry and hear his teachings. 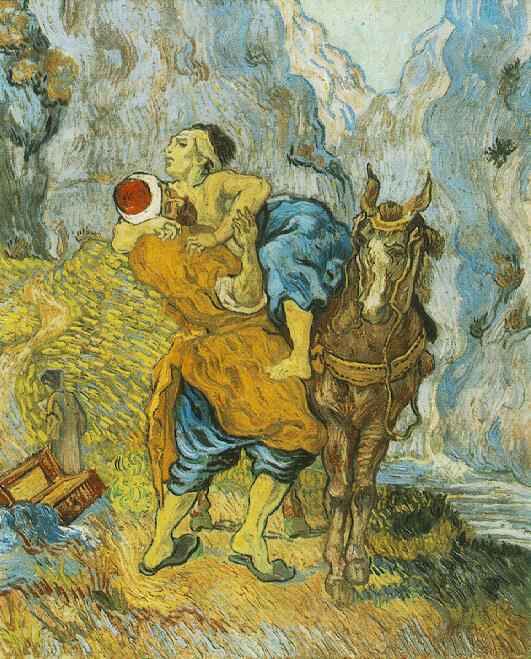 After the Good Samaritan parable, Jesus goes home with Mary and Martha, more women in Luke supporting Jesus’ ministry. Martha honored Jesus with her service (Luke indicates this by having her call Jesus “Lord”), while Mary chose to sit at Jesus’ feet. Jesus refuses Martha’s request and allows Mary to keep seeing him and listening to him teach. Mary is one of the blessed ones Jesus was talking about in v.24 – she chose to see and hear and is blessed because of that. And what exactly are they blessed to see and hear? The parable in the middle of these two related scenes tells us that they are primarily blessed to hear that Jesus has brought an end to exclusion. Picking neighbors and non-neighbors is a thing of the past. All that matters now is being a neighbor. Discipleship is open to all. Samaritans are welcome. Sinners are welcome. Tax collectors are welcome. Women are welcome. Jesus blessed Mary for taking a place at his feet that culture told her she had no place occupying. She is the second woman Luke has placed at Jesus’ feet because he wanted to drive home for us what Mary sang to us in chapter 1. All the old rules and restrictions have vanished. All the old privileges have been turned on their heads. Those of us who choose to see and hear and participate in the reversal that Jesus’ kingdom brings are blessed as well. Sit at Jesus’ feet today and let him continue to teach you how to be a neighbor.